Match balls that add up to 10. 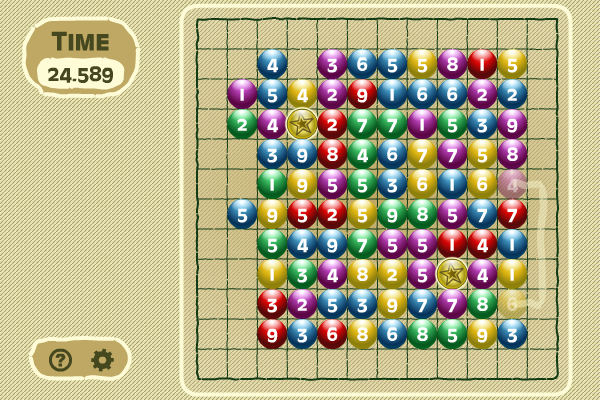 In this game there will be a grid of balls numbered from 1 to 9. You need to match the balls that add up to 10. A pair of balls can only be matched if they can be connected by a line that turns at most twice. If you can match the balls with a star on them, then the other balls will all be sorted by colour and it will be easier to spot the ball pairs. Use the mouse to click the balls to form the pairs. The faster you finish, the higher the score. Hangman States is a modern take on the classic hangman word guessing game we all played when we were kids. It`s the easiest way to learn about all 50 US States. It features colorful, non-violent graphics, digitized sounds, State pictures and more. Find out the shortcut to Halloween treats. Tetris Organizer is a real must have game for every tetris and arcade lover. It packs eighteen different tetris games in one and will bring great fun to your desktop. A score of different games plus skill levels, great design. Upgrades are free. BrainBurst! is the ultimate puzzle game. It challenges and improves abstract thinking and logic. Help the knight to collect all the coins.